Plans for a controversial mixed-use development in midtown Toronto are moving forward once again, albeit with some significant modifications, after years of public backlash and zoning permit denials. Slated for 328 Dupont Street, just south of Casa Loma, the project was first proposed by Freed Developments as a 560-suite residential complex comprised of two towers rising 15 and 29 stories high. 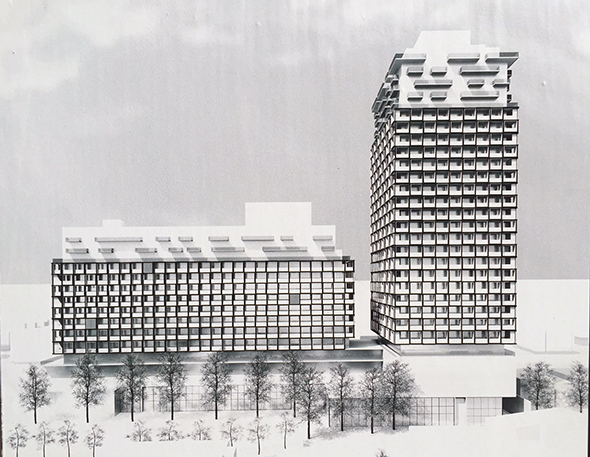 Concerns over the development's size, height and proximity to an important rail corridor saw Freed modify its plans several times, but it was officially shot down at just nine and 19 stories by the Ontario Municipal Board (OMB) in 2017. At the time of its ruling, the OMB put a height limit of 12 storeys (plus mechanical) on new developments in the immediate area. Now, Freed is back with a new proposal for a single building at 328 Dupont—and I must say, it looks way cooler than what was originally proposed. At just under 50-metres-tall, the Teeple Architects-designed building fits within the OMB height guidelines. The resubmitted plan proposes just 84 condo units this time around with 1,674-square-metres of retail space and 3,705-square-metres of office space on the first and second floors. Amenities will include a rooftop deck and three-level underground parking garage, but what's most interesting about this Teeple Architects-designed building (so far) is what it'll look like from outside. The glazed exterior and rounded corners make for a modern-looking structure, and platforms project out from vertical white columns running up and down the facade, like clouds from a beanstalk in Super Mario Bros. 2 for NES. The balconies almost look like they're floating, which is quite unlike most condo buildings in the city right now. Whether or not this proposal is approved remains to be seen, but we can all appreciate Teeple's fine architectural renderings in the meantime.